Winter White Was A Winner! Guess what? The Winter White Semi-Formal was an overwhelming success! If you weren’t there, you should’ve been, and you would’ve been blown away by the turnout- over 150 students came, both upperclassmen and lowerclassmen strongly represented. Complete with a bonfire, epic DJ Isaac Donkoh-Halm, and enough refreshments to feed a herd of starving elephants; the dance had everything someone could want. 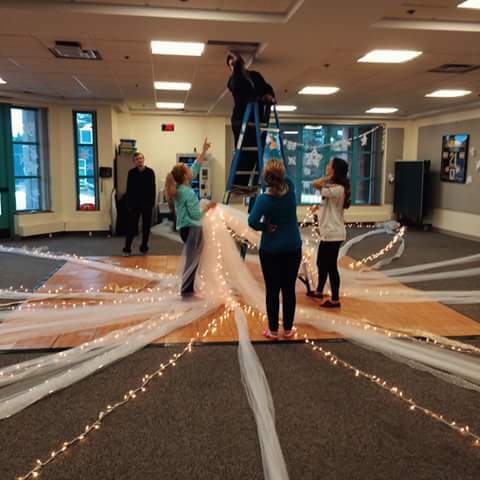 The cafeteria was completely transformed into a Winter Wonderland with plenty of streamers and Christmas lights, and of course, the dancing itself: whether they were Whipping and Nay Naying, Cotton Eyed Joeing, or dancing to EDM, the dance floor was constantly full of kids rocking out. The event wasn’t restrictive of dress code at all- many athletes came directly from a game, still wearing their IACS uniforms! This event has been called “the greatest Semi-Formal ever”. Student Government really rocked it this time! Previous Previous post: Winter White Waltz This Friday! Next Next post: New Semester Brings… New Stress?